Having a good caster can save many of your expenses. Therefore it’s better to go for the quality. Here we present before you the best casters available till date so that you could select the ideal caster for yourself. 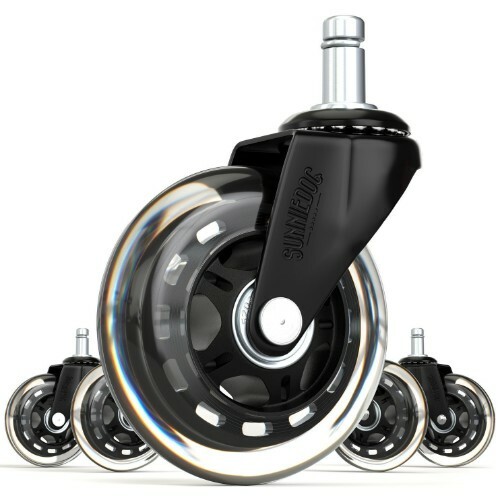 The list under provides you with the best 10 Casters available. You can choose the best for you. Although it seems small, the caster is a very important invention done to make your life easier. Casters save your floors from being ripped off. Caster prevents your flooring from all the wear and tear which occurs because of the chairs or tables you use in your homes and offices. Therefore, casters are indeed needed to save your floor and money. 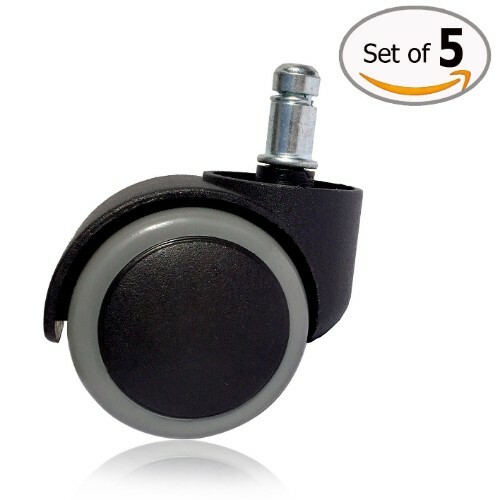 If you are worried about damages to your expensive floors, due to rolling chairs, then get rid of those cheap, low-quality caster wheels and try the Office Oasis Caster Wheels. These caster wheels are long lasting, has high weight bearing capacity and provides quick and smooth rolling. The Office Oasis Caster Wheels are made up of polyurethane material. This material has high tear resistance and high tensile properties which makes it very durable. Due to its unique rollerblade style, only polyurethane comes to contact with the floor which is a rubber-like material and never causes any damage to your expensive floors. These wheels are completely safe to use on hardwood, tile, carpet, laminate and many more floors. These caster wheels have high weight bearing capacity, they support up to 650 lbs (295 Kg) as a set of 5. Hence stop worrying about falling from office chairs by breaking of caster wheels. 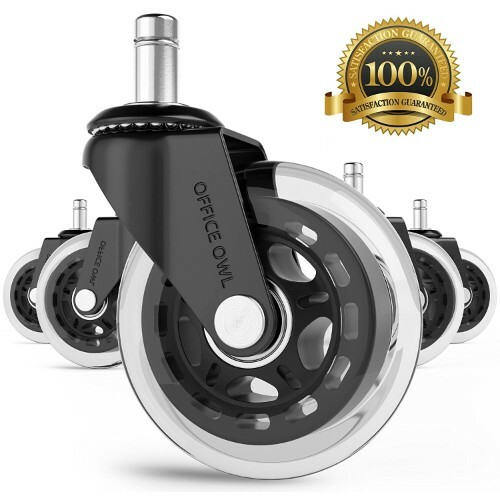 These caster wheels are made in rollerblade style by Office Oasis to solve all the common problem with office chair casters. It never scratches your expensive floors which totally eliminates the need for chair mats. This caster has stainless steel ball bearings which allow it to roll smoothly and silently. The attachment stem of the Office Oasis Caster is made of stainless steel. We do not require any tool to fit wheels to the chair; Each of these caster wheels has a grip ring stem that makes them compatible with the base of 97% office chairs available in the industry. The stem has 1.111 cm diameter and 2.222 cm length. To check the compatibility of these wheels with your chair, pull out the current caster wheels you are using with the chair and match the dimensions. Hence feel free to move all around in your workplace without worrying about damage to the floor. These casters will make rolling chair very smooth and silent that it will never disturb your colleagues while you roll your chair around them. Do not work on pine floors. SunnieDog never disappointed its customers. The SunnieDog Office Chair Caster Wheels are really durable, safe for all floors, quiet and smooth, and very easy to install. The tires of these caster wheels are also made of soft polyurethane, a crystal clear rubber-like material which makes it safe for all the floors including hardwood, tile, linoleum, laminate, bamboo, concrete, slate, marble and glass floors. These soft tiers have high tear resistance and high tensile properties which makes them extremely durable. These casters wheels are not noisy like traditional plastic wheels, they have the precise ball bearing, made of stainless steel, to roll very quietly. Due to stainless steel ball bearing, the chair moves by a minimal push of your legs. It can bear up to 650 lbs weight even after that moving the chair will be smooth and silent. Installing these casters is really easy. Pull out the old casters, and push the new SunnieDog Caster Wheels into the same base hole. Dimensions of the stem of these casters are universally acceptable, it has an 11 mm diameter and 22 mm length. This stem also has a grip ring to fit the caster properly with the chair. Therefore, if you are searching for a smooth, silent, and durable caster, then you may go for this product without thinking twice. It does not fit on all kinds of chairs. Now, there is no need for you to keep those old plastic mats in your homes or offices because Office Owl Chair Wheel is here. These casters protect your floors from all kinds of damages. So, you don’t need to put any mat on your floor to protect it, just the caster is enough. 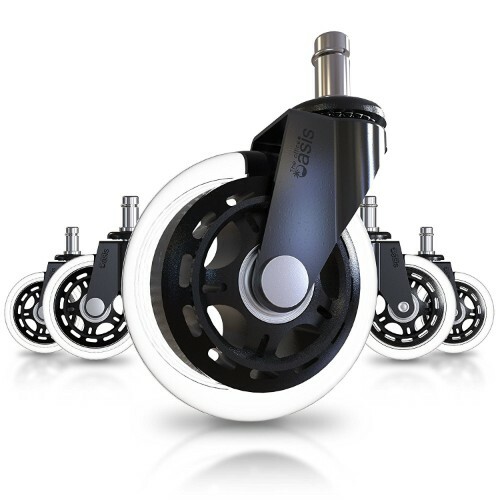 The internal parts of the caster are made up of superior grade steel that can easily support a weight up to 650lbs. The owl office made these wheels with polyurethane which provides you with super smooth rolling. These wheels are one of the best wheels and can work even for a whole lifetime. 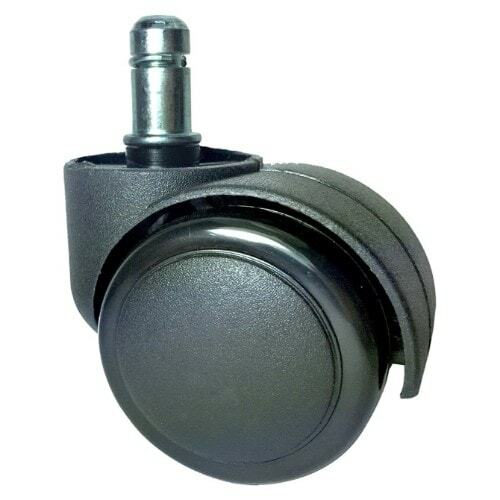 Zitriom Office Chair Caster is specially designed to protect hardwood, slate, carpet or tile flooring. These cater wheels are reliable, heavy-duty, and durable. So, if your flooring is one among as stated above, then you should definitely go for this product. These caster wheels are reliable; It will keep your expensive floors safe. The Zitriom Chair Casters are covered with polyurethane material which never harms hardwood floors, laminate, carpets, any tile, or slate. The rubber-like polyurethane covers the sharp edges of the wheel to prevent damage to the floors. It creates proper friction for rolling and prevent dragging. The Zitriom Chair Casters are heavy duty casters. They can bear maximum weight up to 500 lbs as a set of 5 which is required in a standard office chair; As an individual, this wheel can carry 100 lbs weight. These caster wheels have standard stem size, the stem is 11 mm in diameter and 22 mm in length. This stem has a groove in which a metal ring is fixed which helps to fix the wheel in the base of the chair. It can easily fit in all the standard office chairs without any problem. You can check the compatibility of this caster wheels with your chair by measuring the currently installed caster wheel in your office chair. Hence if you need simple yet durable caster wheels for the chairs in your office, then you can always go for this product. Fits on the wheelchairs only. These Premium Casters are made to protect floors that are made up of hardwoods and all other types of hard floors. It can carry weight up to 100 lbs each and 500 lbs when used in a set of 5. The outer most surface of the wheels is of polyurethane material due to which the rolling is very smooth. Therefore if you have a hardwood flooring in your house then you should definitely go for this product because it has been significantly designed for that kind of flooring only. The stems of this caster are not removable. Therefore in the end, after having a look at the top 5 casters available worldwide, it would be a very easy task for you to select the most appropriate caster for yourself. Whether it is for wooden floors or for carpets, you can select the best one for you.